We had spent about three hours and climbed about twenty five hundred feet so we were tired. We had lunch and rested a little before we climbed to the next lake up the canyon. We decided that the next lake would be better fishing. 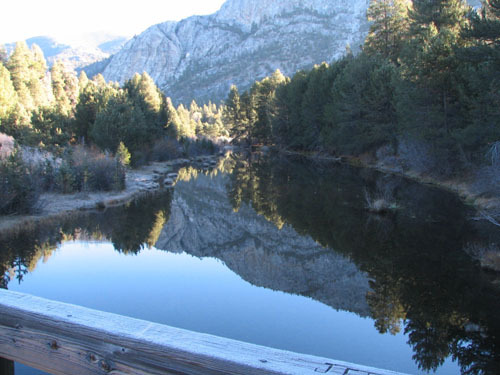 Although, this lake had nice fish cruising off shore it was the first lake in the canyon with heavely used campsites. Thus we pressed onward and upward towards the second lake. 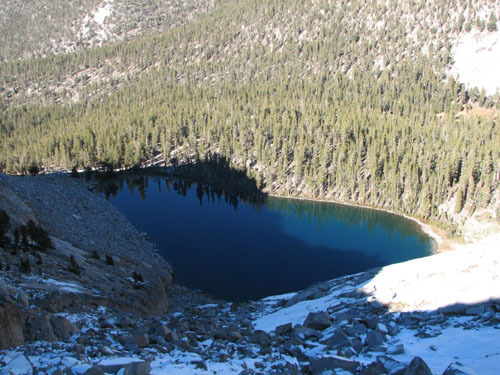 The second lake had snow patches in the shadows but we found a relatively sunny location for our tents. The site had a campfire spot and a grill with plenty of downed wood for the fire. The big difference was that at this time of year the sun was low on the horizon and it meant that because of the peaks near the lake the site was in the shadows at about three thirty in the afternoon. Once the sun went behind the mountain it got plenty cold in a hurry. We were both glad that we brought our long underwear and plenty of layers. We fished for about a half an hour before the shadows and the cold got to us and we met back by the fire and fired up the stove for some hot cocoa and soup to start the evening meal. 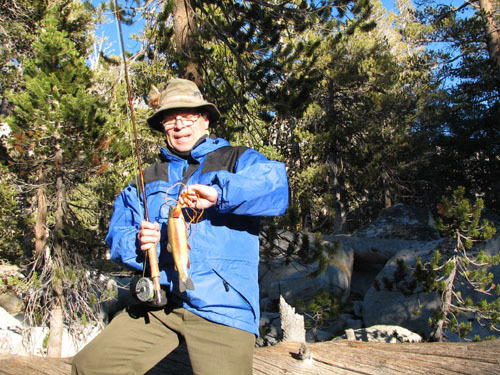 Gary had caught a nice twelve inch golden and I had caught about a ten inch golden which we cooked in foil for an appetizer to our freeze-dried meal. We had climbed about three thousand feet and although the trail was only about five miles long we hadn’t slept very high and if you are not used to the altitude change you can get altitude sickness. There is a medicine that was developed for glaucoma that the climbers found by accident that reduces or eliminates altitude sickness. The medicine is called Diamox, and a prescription is required to obtain it. Tony had taken some in the morning but Gary had not and was feeling the effects of the altitude. So an early rendezvous with the sleeping bag was extremely welcome. and down the scales based on the strength of the wind and the height of the sun. So standing still, there in the warm sun, listening in the calm of the early morning, it was if by magic one could hear the ice singing to Helios, rising over the peaks spilling dawn onto the lake. 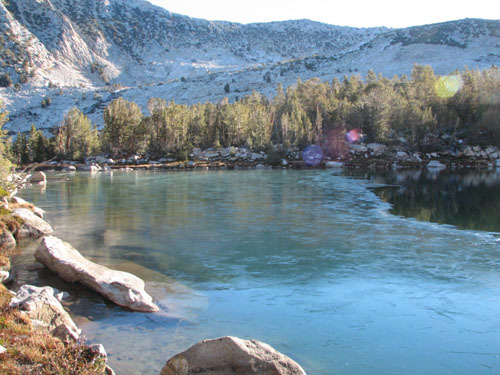 The ice was fairly thin and after a while, we could see golden trout swimming under it. Aye! The quarry had been spotted, the game was afoot, and fishing time was a wasting! The sun set on our campsite and the cold quickly took hold. So a roaring fire was made and we had some soup and cocoa. We prepared the fish in foil with spices. One can only spend so much time wandering around in total darkness or in a tent, so we sat around the fire telling stories for a long, long time. Some of them were even true! We climbed into the tents about nine pm and drifted off to sleep listening to the sounds of the night woods or football scores. We were up early at dawn the next day for breakfast of cereal, fruit, and cocoa around a warm fire. We decided to fish the lake we were at for a few hours and then to fish the first lake in the canyon on our way out. We got several fish to carry out at our camping lake. 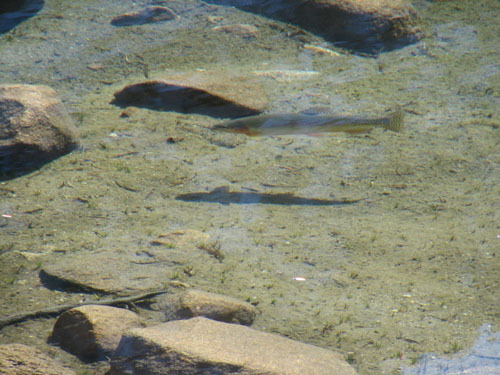 However, we tried in vain to get some of the wary trout “cruisers” at the first lake. So we consoled ourselves with an afternoon dinner at an excellent Mexican restaurant in Madera called Burrito King on Olive St. It was a good trip with many great shared memories. Did you ever hear the story about camping next to the giant snow bank . . .